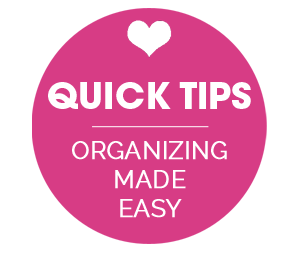 When I think of January, I think of organization. There is just something about a new year that inspires folks everywhere to want to start with a fresh and blank slate. And that usually correlates to organization! And organization correlates to an excited and happy Jen! So here I am, feeling much, much better than I did a week ago. Still sniffling but I will take it! I can organize through sniffles! There are still three full weeks through the end of the month, and I am certain that although I already lost one week, I can still get back in the game, and tackle four different challenge areas. Won't you join me? For this mini-monthly challenge, I selected four problem areas ranging in type and magnitude. Two smaller, two larger. I find it always helps to start small and work my way up as my momentum builds. And it also helps not to bite off more than I can chew all at once. We have organized countless areas around our home over the years. We are to a point where most of those systems are working like well-oiled machines, and a few others that still need a little tweaking. And then we have some areas that need our full attention. I went through the house and picked the four that called my name. These two small drawers live in our sideboard in our dining area and have become a catch-all for anything party or entertaining related. The cabinets below have a similar task, but hold bulkier pieces such as glassware, pitchers, vases, etc... I can already envision myself modifying the cabinets while I work on the drawers since they all have a similar storage purpose. I don't think I need to go into detail about what the problem is, as the picture is pretty clear (hello jumbled mess). But the ultimate goal is to purge anything we haven't used and create a bit of proper storage for what remains. I utilized this area on multiple occasions the last few months (Thanksgiving, small gatherings, Christmas & New Year's Eve), and each time I was quickly reminded why I need to tend to these two small but mighty drawers. My gut tells me that most husbands receive a nice metal tool chest when they ask for tool storage for Christmas. My husband received an elfa system (enter devilish laugh here). And it is a mess! We made it as far as assembling the majority of the two stands and adding the drawers (although we have to pick up a couple more pieces to completely finish it), and from there everything sort of just got tossed into a drawer or landed on top. I am not doing this incredible system any justice right now! 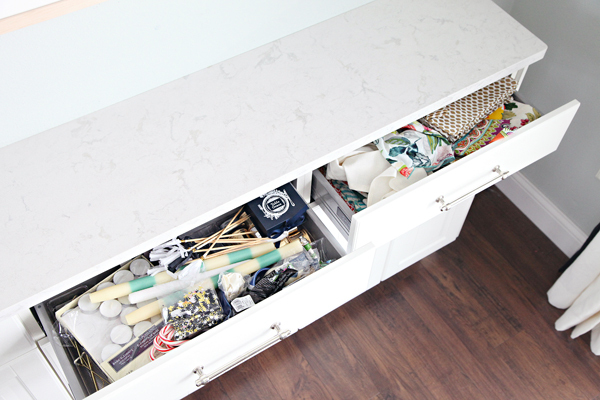 We need to sort, purge, and line all of the drawers with pretty floral gift wrap. I kid! Just seeing if you are paying attention. However, we do want to line the drawers with a grippy liner to prevent everything from sliding around inside. And the drawers need to be labeled. And really, everything just needs to be addressed. This won't be the most glamorous project, but it is much needed. You may recall that we were previously using an old hand-me-down dresser for storing many of our tools, but over time the weight was too much and the drawers began to collapse. 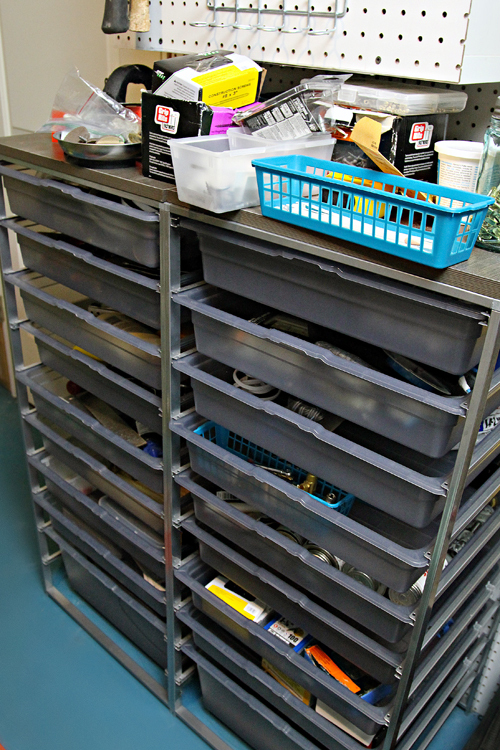 The elfa drawers have already proven to be so handy and the entire cart can hold and sort so much more. I really can't wait to see how this little high-traffic area turns out! I am about to literally air our son's dirty laundry, but this impractical closet is not at all his fault. Back in the day, we saved money be re-installing the original wire hanging system after we wallpapered the closet. The simple two hanging rods worked just fine in terms of giving our guests a place to store and hang clothing during short visits. Now that our youngest son has taken over the room, the closet is not up to par. He has never owned a dresser, so he has been living out of bins and baskets tucked away on the floor. 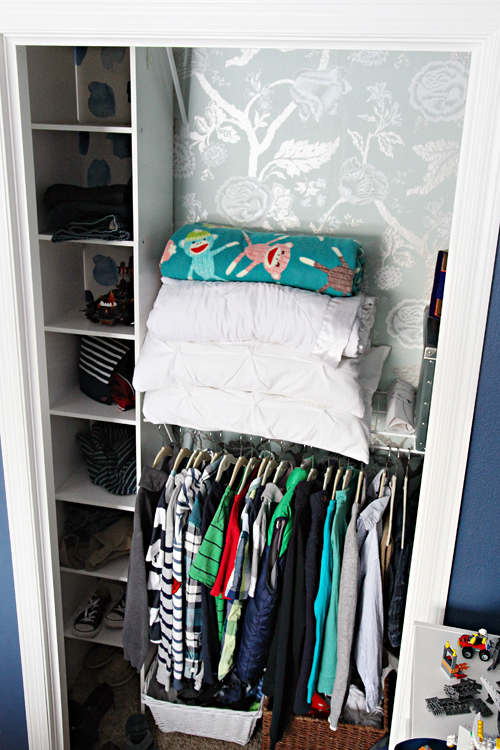 Half of his clothes are also stored in a bin under his bed where they are easier for him to put away. He is unable to reach or use the vertical space, so we plan to completely reconfigure things, while also finally removing the old wallpaper and continuing to install the same paper seen in his desk area. I envision a couple of hanging areas, a tower of drawers, a place for shoes and a place for a hamper. We also hope to ultimately close off the closet with some new swing doors similar to the ones we installed in our kitchen. Sigh. What it is about showing your messes to the masses that leaves you feeling a little vulnerable and naked? I just keep telling myself that a good before photo always makes for an even better after story. And real life is messy. And seeing these sit here totally motivates me to tackle each one of these spaces this month! 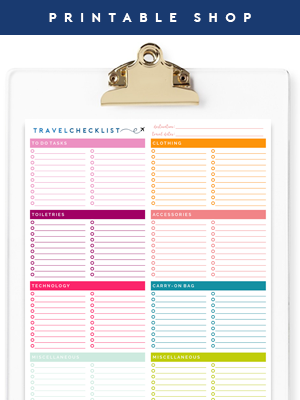 What are your organizational goals in January? Taking on any areas, big and/or small? I would love for you to share what you are working on by using the #iheartorganizing hashtag on Instagram or in the comments below. Oh! 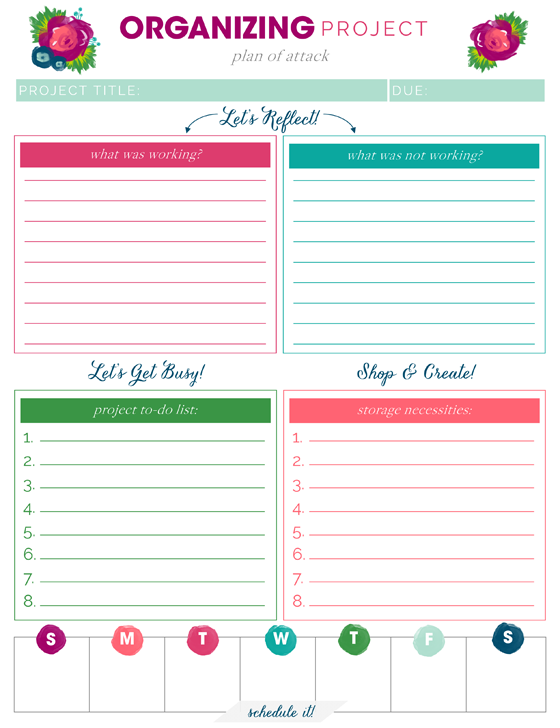 And if you are looking for a little organizing of your organizing projects, this project planning printable has been quite helpful to me over the years! Alright, let's do this 2017! Why are kids closets so hard to keep organized??? Oh yeah, they belong to kids. Ha! Both of my boys closets need major attention. 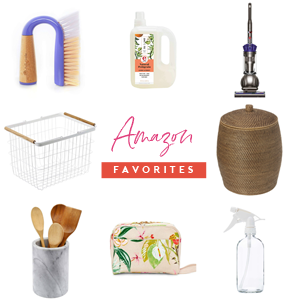 I would love to see some budget friendly inspiration! Absolutely! It is always a work in progress! Life changes, needs change! And sometimes things don't work as planned. You should feel super proud of all of the progress you made last year! Yay! I can't wait for the reveals! This is getting me motivated! Thank you! I just want to tell you that you posting these pictures makes me feel so much better! 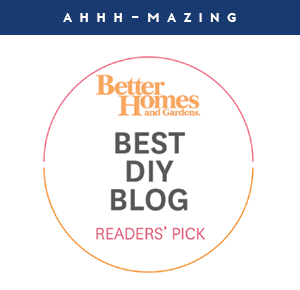 Your blog is my favorite but sometimes I just wonder how you can keep every single inch of your house so together all the time?! This shows me that you have a little in your house what most of us have all over our house! Thanks for being vulnerable and real! I love the idea of just picking a few spots to really focus on! Our big January project is getting our basement organized...pretty much the whole thing and so far progress is being made. It's exciting! My son uses a small step stool to reach the clothes on the higher rods. The stool stays in his closet. One of my goals is to declutter our entire home. So to make this happen we are going room by room. I can't believe how much organization needed to be done! I feel like having an entire month dedicated to each room will really transform our home though :). I can't wait for (Elfa) tool organization!!! Thanks, as always, for everything Jen!!! Thank you Jennifer! 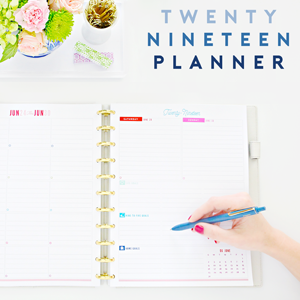 And yes, I listed the planners in December, just had a slight delay on the photographs so my sidebar hasn't been updated yet. :) xo! Wow! It is so comforting to see the before and afters of organizing projects. It makes me feel like less of a failure when I see that even the most organized of people have messy lives. Haha! Our big projects are tackling the (lack of an) organization system in our Kitchen. When I moved in, we consolidated but didn't purge and create a system for anything, so it's all... thrown in convenient places and we can't find anything. Except cupcake liners.... I've found them in 3 different places. It was a really quick move and I should have taken the time to do it, but I didn't... LOL My old kitchen was so organized! It's bringing me down. So, now I have to tackle it before it drives me nuts! You've already inspired me to put Contact-papered foam core liners in my wire baskets so the spice bottles don't fall over. My next project is under our kitchen sink. We just replaced the leaky faucet -- what an improvement the Delta faucet is. As I pulled out the wet stuff from underneath I realized I'd like it to be better organized. 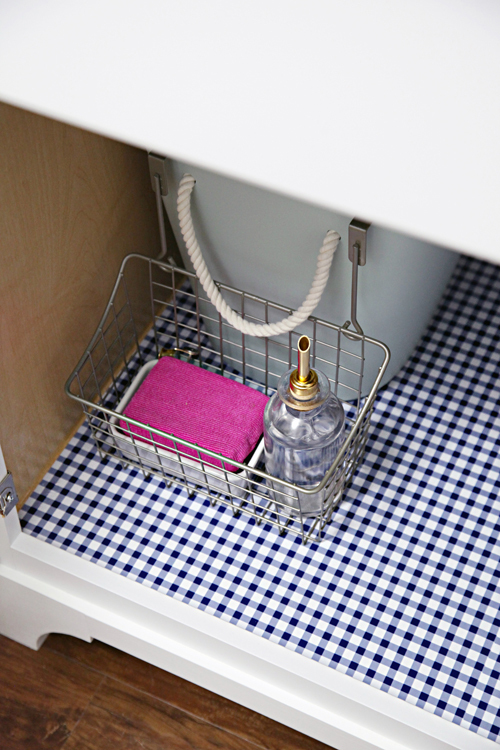 Putting down a better under sink mat for starters.